Amazingly, Charles Duke has an Apollo 11 connection as well, as he was the CAPCOM (capsule communicator) in Mission Control who spoke directly with the astronauts onboard the crippled ship. He hater became the youngest astronaut to step foot on the moon at age 32... I turned 32 last year... boy am I a loser... haha! 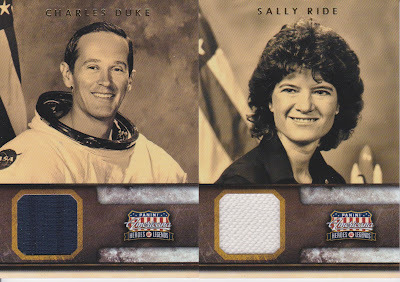 As for Sally Ride, what can I say that hasn't already been said, a pioneer and a great advocate for science education. Awesome card. Looking at the checklists, it looks like I've gotten pretty fortunate over the last 3 blasters to get 3 NASA/astronaut relics. There are a lot of soccer, Olympic and other pop culture cards in there. I may have to look out for sales on Hobby Boxes for this stuff. If anyone has base cards, I'm about a dozen short of the complete set, send me an e-mail and we can exchange numbers. I have plenty of base dupes if anyone is looking for anything from this set. Thanks! The space geek in me is digging those pulls. Nice!